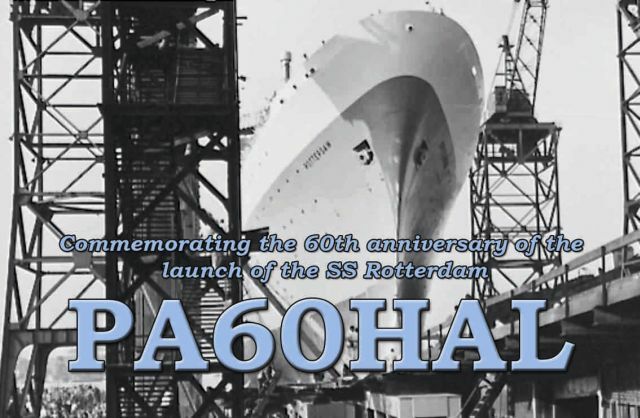 60 years ago, on September 13, 1958 the SS Rotterdam was launched at the RDM shipyard in Rotterdam. This date is the start of a year full of activities on the ship, to celebrate this anniversary. PI4HAL will participate in the festivities by using a special callsign between October 2018 and October 2019: PA60HAL. Of course, this includes a special QSL card. The radiostation PI4HAL will be active during Maritime Radio Day (MRD) on Friday April 14 and Saturday April 15. This worldwide radio event is held yearly to celebrate the achievements of radio telegraphy and to commemorate what it has done for the shipping industry. This event takes place around April 14, the day the RMS Titanic sunk, this year 105 years ago. Cable trays are used to hide the cables (antenna-, power- and network cables). These trays are also nicely hidden, but can be opened if needed. A beautiful ICOM-765 has been donated and will be used as the main HF transceiver. A CAT interface is under construction to enable control by the HamRadioDeluxe software. The old operator desk has been replaced by an adjustable desk and a mobile office chair. 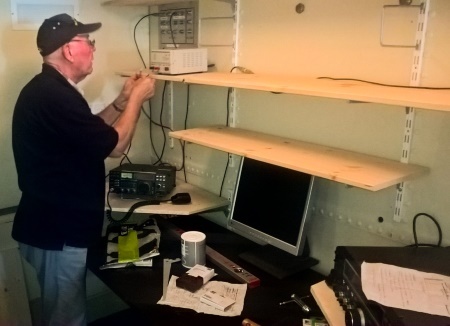 A cable tray will be mounted at the new operator desk for hiding the antenna cables running between the transceivers and the antenna patch panel. More equipment and gear will be placed to give the room a maritime look-and-feel. And of course the old credo is still true: WILL THE SHACK BE EVER FINISHED? We owe a lot of thanks to different parties and individuals. There is allways a risc to forget someone, however we would like to say a special 'thank you' to ‘de vrienden van het ss Rotterdam’, WestCord Hotels and the facility department of the vessel. But also many members of PI4HAL have put a lot of effort in this project. It has been a hectic (and hot) time, that has proven that cooperation pays off! Last Saturday April 2, maintenance was performed on the station and antennas. Especially the VHF/UHF antennas on the foremast needed some attention. The connecters appeared to be in bad shape, so they needed to be re-mounted. The antennas worked again as before, after this intervention on 38m height by Okko, PH2CV and Wil, PA0WBS. Last week, a short movie clip was shot covering our station PI4HAL. The clip was shot by Ryan Derks, a professional camera man/video editor. We want to thank Ryan for this nice piece of work. Of course we also want to thank the main characters in this movie: Gerard PA3AFG, Wil PA0WBS en Bert PC4Y. Some members of the VERON section Rotterdam A37 will activate the lighthouse Phare de Calais in France during the International Lighthouse and Lightship Weekend (ILLW) on August 15 and 16. They will be QRV on all HF bands with two stations. The lighthouse is built in 1848 and is situation on the edge of the centre of Calais. After having climbed the 271 steps, the lighthouse offers a spectacular view on the white cliffs of Dover. Also one can see how many Ferrys sail between Dover and Calais. The crew of TM0PDC/LH (Phare de Calais) consists of Kees, PE1EXD, Erik, PE1NOJ, Wil, PAØWBS, Jasper, PD2JFX and Okko, PH2CV. The station will be QRV as much as possible, to enable as many amateurs to make a QSO with the lighthouse. THe ILLW number of the lighthouse is FR0008 (FRA-004 according to ARLHS). We will be QRV on SSB, CW and digimodes. We will try operate also on saturday and Sunday night, however, since we need cooperation of the lighthouse attendant, this cannot be guaranteed yet. 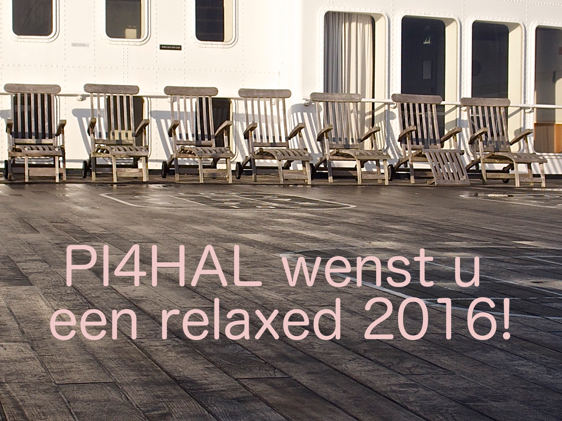 During the worldchampionship Beachvolleyball 2015 the clubstation PI4HAL will be using the special event callsign PA2015BEACH. This event will be held in front of the ship from June 22nd until July 5th. We will try to activate all hamradio bands and modes. A contact with the station will be rewarded with a special callsign.